Louise Lawler (born 1947, Bronxville, USA) lives and works in New York. Her current show in London’s Sprüth Magers exhibits a series of tracings illustrating the artist’s desire to continually explore and push herself onward. Lawler is well known for her photographs and these (from which the “No Drones” were modeled upon) were recently developed for an exhibition at Museum Ludwig, Cologne. Where the photographs were medium sized (about 36″ wide, these tracings are 4 times the size! Lawler’s solo exhibitions have included: Museum Ludwig, Cologne (2013), Albertinum, Dresden (2012), Wexner Center for the Arts, Ohio (2006), Dia: Beacon, New York (2005), the Museum für Gegenwartskunst, Basel (2004), the Hirshhorn Museum and Sculpture Garden, Washington D.C. (1997), The Photographers’ Gallery, London (1997), Kunstverein München (1995), Centre d’Art Contemporain, Geneva, (1994), Museum of Fine Arts, Boston (1990), and at the MoMA, New York (1987). Major group exhibitions include Hammer Museum, Los Angeles (2014), Palazzo Grassi, Venice (2011), Barbican, London (2008), the Whitney Biennial at the Whitney Museum of American Art, New York (2008, 2000, 1991), the Institute of Contemporary Arts, London (2004), Museum of Contemporary Art, Chicago (2002), Kunsthalle Basel (2000), Kunstmuseum Düsseldorf (1997), the Art Institute of Chicago (1990), the New Museum of Contemporary Art, New York (1990, 1986, 1985), and the Museum of Contemporary Art, Los Angeles (1989, 1988). 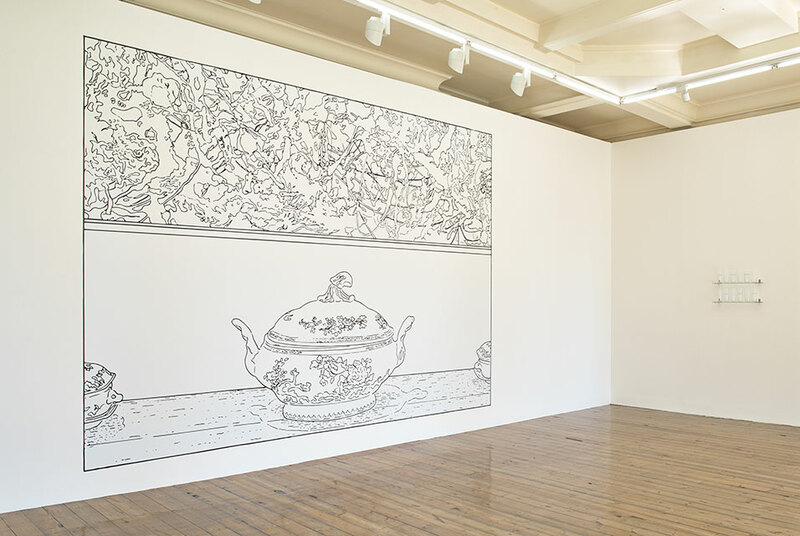 Installation view, Louise Lawler, ‘No Drones’, Sprüth Magers London, July 2 – August 23, 2014 Photography © Stephen White. Below: Installation view, Louise Lawler, ‘No Drones’, Sprüth Magers London, July 2 – August 23, 2014 Photography © Stephen White.